One of my readers who requested anonymity asked to interview me. This is not his photo. I asked him, "Do you want to dissect me? No, no. I'll ask the usual questions. Q: Did you always want to be writer? A: No. My first choice, at ager 5, was being a CLASSICAL PIANIST. At are 13, I began studying with a “new” teacher who said I had to memorize every note, as with a photographic memory. That was impossible for me. I quit. UCLA: The professor called back me every day for the auditions to "Hedda Gabler" for the LEAD. I was a freshman and never read the complete play, overwhelmed by the enormity of the project. After that, I experimented with one-act plays, did not take to the chaotic lifestyle, and left college. I went into outer space. 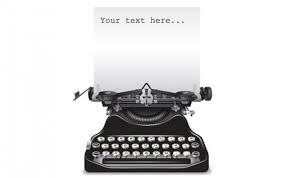 I sat down at the typewriter and typed the way I talked: a test case. When I pulled the paper out of the roller and read it, I said out loud, “Hah! I’m correct. There’s nothing here.” I tossed the paper away. And that was that. Time marched on. Hillary came home from high school one day with her girlfriend who said to me, “My mother is writing a novel.” It was like the blast from a cannon. Without a second of hesitation, I turned on automatic. I telephoned the mother. “Let’s go out for coffee. I’ve got to talk with you.” That mother told me she had enrolled in a novels workshop. My life changed. Q: Do you have any regrets about turning in this direction? A: Yes, that I didn’t start writing in my twenties. What a waste. Q: What is your writing routine? I mean, when do you do your writing? A: Like most writers, I write productively in the morning hours, about three hours. My second wind comes at night, but writing at night stimulates me too much. I suffer insomnia anyway. Q: Do you write in longhand or directly onto the computer? A: I was taught to get into the habit of writing on the computer as soon as possible. With my mighty cup of coffee (logo for my former newsletters), I quickly started on the computer. Today I stand at the computer (better for the back), but my first novels were written sitting down. Q: What was the most significant event in your life, I mean beside marriage and motherhood? A: Attending college a second time. I had dropped out of UCLA, a theatre arts major. Then five years after Marv married me, my wonderful husband said (out of the blue), “Do you want a house or do you want to go back to college?” I replied, “I can always have a house. I want to go back to college.” I started from scratch. Q: Did your husband (who was earning his doctorate at USC at the time) have advice for you as you re-entered college? A: I should say so! “Always sit in the first or second row of class so that your attention stays focused, and never get behind in your homework.” I listened to him, thank God. Q: But you did not return to UCLA. Why not? A: I needed to stay focused. In classes of 250 students at UCLA, I didn’t have a chance. So I attended a state college, CA State U at Northridge, where there were only 30 students in the class. Interestingly, the Eastern Seaboard colleges (e.g., Yale) had at that time very small ratios of professors to students (1: 8). I thrived in the smaller classes and was taken into the English Honors Program. Q: THE PROVIDER was your first novel. Did you have trouble deciding what the subject would be for your first novel? A: No. It was a given. That novel was all around me. I grew up living that novel. Q: So, is it your favorite? A. Yes. And my most personal. In the same way that Eliah Kazan’s most personal screenplay was “America, America”, and Billy Crystal’s was “Mr. Saturday Night”. Q: Would you say your themes have a similarity? A: Yes. Not unusual. Most writers handle the same theme over and over, but from different angles. I treat aspects of love stories, not romances. Q. You started writing late in life. You inspire people who think it’s never to late. I think the only person who started later was Harriet Doerr with her fine novel “Stones of Ibarra”. I think it was her Master’s Thesis at Stanford, and she received lots of encouragement at age 70. She continued to write, but not as much as you. You were like a locomotive: I mean once you got started you kept going, and are still going with five published novels and two yet to be published. And there are some short stories. Do you think you will continue to write novels? A: That’s an interesting question. 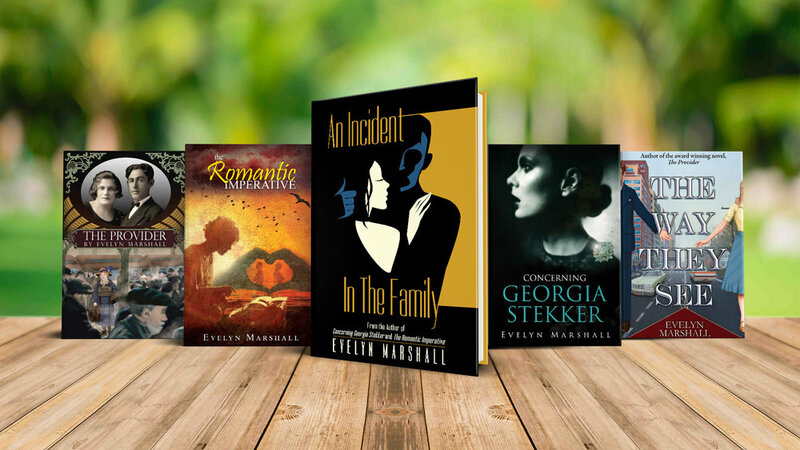 The last novel I wrote was “An Incident in the Family”. It wrote itself and I held onto its coattails. What I came to the end of what I wanted to say, I simply stopped. It was unlike anything I had written. Since then, I have been writing short stories. Something happened with that experience. I’m not certain where my writing will go from here. Often, Henry James has written short stories that he thought would turn into novels; some did. We'll see. I just wrote a short story, “The Arrangement”, with the intention of turning it into a novella or a novel. But I restrained it into a short story. Why? There was great fun in resolving the problem early. “The Arrangement”, along with a few other new short stories, may appear in a collection. Q: Your literary voice is distinctive. I would say that your narrative style is lyrical, and you balance it with a great deal of suspenseful dialog. Do you consider yourself a stylist? Q: Ms. Marshall, I enjoy your writings very much. Will you permit me to interview you again in the future? Older PostEvelyn's Blog - Feb 10, 2018 - "THE DEBT"